Of all the great inventions and discoveries of Nikola Tesla, nothing stood out with greater potential benefit to the whole of humanity than his discovery of Radiant Energy in 1889. The series of observations that led to the discovery of Radiant energy initially grew out of experiments that Tesla had conducted in an attempt to duplicate the results that Heinrich Hertz had claimed to achieve in affirming the existence of electromagnetic waves, the discovery of which Hertz announced in 1887. While replicating Hertz’s experiments, Tesla experimented with violently abrupt DC electrical discharges and discovered a new force in the process. Only after conducting exhaustive experimental trials for the next three years, did Tesla announce this stupendous discovery in a paper published in December, 1892, entitled “The Dissipation of Electricity”. Incredibly, most academicians of the day completely missed the mark in understanding the true significance of his paper. 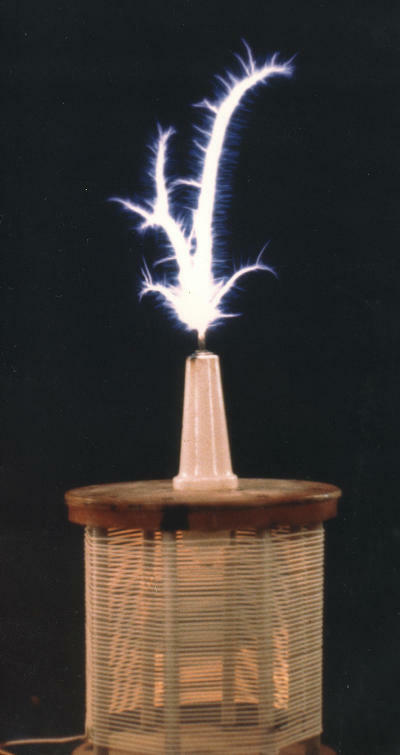 Noted scientists such as Sir Oliver Lodge, mistakenly thought that Tesla was referring to high frequency AC electricity in the operation of the Tesla Transformer, a huge blunder that remains to this day in the misnaming and misinterpretation of the Tesla Coil. The transformer that Tesla referred to in the 1892 paper did not operate on magnetic/electric field induction created by alternating currents. It operated in an entirely new domain of physics based on abrupt discharges of electrostatic potentials and the subsequent release of kinetic Radiant Energy from the omnipresent ether. Tesla was now operating under entirely new rules which he referred to as “dynamic” electro-static forces and had, by now, completely abandoned any further interest in the AC waveform. The genesis of the Lodge misunderstanding, however, began a few years earlier with the publication of certainmathematical formulas by a brilliant Scotsman named James Clerk Maxwell. Using mathematical models, James Clerk Maxwell had earlier suggested that two different types of electrical disturbances could possibly exist in Nature. One type was a longitudinal electric wave which required alternating concentrations of densified and rarefied pulsations of electrostatic fields that moved along a single vector (today, we refer to these as standing waves or scalar waves). Maxwell ultimately rejected this idea because he was convinced that this type of wave propagation was impossible to achieve, but his assumption was erroneous and would later portend formidable consequences for Tesla and the world at large. Maxwell’s second wave postulation was that of a transverse electromagnetic wave that exhibited a rapid alternation of electric fields along a fixed axis that radiated away from its point of origin at the speed of light and was detectable at great distances. Maxwell had more faith in the existence of this type of wave and encouraged experimenters to look in this direction. It was the discovery of this type of wave that Hertz had laid claim to, but Tesla was meticulous and fastidious in replicating Hertz’s experimental parameters and he could not obtain the results claimed by Hertz. Before Tesla’s invention of the Polyphase AC generator became the industry standard and overtook Thomas Edison’s use of DC generators, the DC electrical system was the only system available to deliver electricity to America’s homes and factories. Due to the resistance offered by long transmission lines, Edison had to produce very high DC voltages from his generators in order to deliver enough voltage and current to its final destination. He also had to provide additional ‘pumping’ stations along the way to boost the sagging voltage which dwindled from line losses. A curious anomaly occurred in the very first instant of throwing the power switch at the generating station: Purple/blue colored spikes radiated in all directions along the axis of the power lines for just a moment. In addition, a stinging, ray-like shocking sensation was felt by those who stood near the transmission lines. In some cases, when very large DC voltages surged from the generators, the “stinging” sensation was so great that occasionally a blue spike jumped from the line and grounded itself through a workman, killing him in the process. Tesla realized almost immediately that electrons were not responsible for such a phenomena because The blue spike phenomena ceased as soon as the current stated flowing in the lines. Something else was happening just before the electrons had a chance to move along the wire. At the time, no one seemed to be very interested in discovering why these dramatic elevations in static electrical potential were taking place, but rather, engineering design efforts were focused on eliminating and quenching this strange anomaly which was considered by everyone to be a nuisance-except Tesla. Tesla viewed it as a powerful, yet unknown form of energy which needed to be understood and harnessed if possible. The phenomena only exhibited itself in the first moment of switch closure, before the electrons could begin moving. There seemed to be a “bunching” or “choking” effect at play, but only briefly. Once the electrons began their movement within the wire, all would return to normal. What was this strange energy that was trying to liberate itself so forcefully at the moment of switch closure? . In the later quarter of the 19th century, Tesla was alone in his opposition to the fundamental views of the nature of electrical forces as described by three of the biggest names in electric science: James Clerk Maxwell, Herman Von Helmholtz, and Heinrich Hertz. 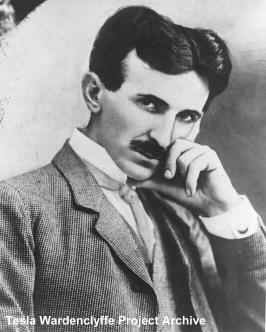 Tesla possessed a broader vision of the cosmos because his keen sense of awareness and especially his natural intuitive insights gave him a deeper understanding of the role that the ether (or aether) played in the manifestations of all electrical phenomena while his contemporaries focused their attention exclusively on the electromagnetic component (assuming that no other component could be involved). This lack of etheric insight by his contemporaries (with the exception of Sir William Crookes) and the heated controversy that the mere mention of the ether had engendered was to cause Tesla ridicule and sarcasm from men of inferior intellect for decades. The ether controversy largely dissipated in the academic arena after the publication of Eienstein’s Theory of Relativity (1905) and the Michaelson-Morley Experiment which essentially declared that the ether ‘theory’ was dead, but Tesla’s insights and deductions concerning the role of the ether were correct all along. The ether existed then and it exists now, despite the lock step denials by mainstream science, past or present. Rudolf Steiner, another man of genius, affirmed that the ether was composed of four fractions which he described as 1) the Light Ether, 2) the Warmth Ether, 3) the Chemical Ether, and 4) the Life Ether, a combination of the first three. Tesla’s New York and Colorado experiments confirmed for him that Radiant energy was bound up within the elusive ether, but could be made manifest by the creation of an abrupt disruption in the equilibrium of the ether fractions using one way, high magnitude pulses of short duration. This was the key that unlocked Radiant Energy. Unlimited electricity could be made available anywhere and at any time, by merely pushing a rod into the ground and turning on the electrical appliance. Homes, farms, offices, factories, villages, libraries, museums, street lights, etc., could have all their lighting needs met by merely hanging ordinary light bulbs or fluorescent tubes anywhere desired- without the need for wiring -and produce brilliant white light 24 hours a day. Motor energy for any imagined use such as industrial applications, transportation, tractors, trucks, trains, boats, automobiles, air ships or planes could be powered freely-anywhere on the planet from a single Magnifying Transmitter. This new form of energy even had the ability to elevate human consciousness to levels of vastly improved comprehension and mental clarity. Undreamed of therapeutic applications to improve human health and to eliminate disease conditions could have been achieved fully 100 years ago had Tesla been allowed to complete his commercial development of Radiant Energy. But powerful barons of industry, chiefly in the person of John Pierpont Morgan, colluded to deny him the financial backing he needed and in doing so, effectively denied mankind one of Nature’s most abundant and inexhaustible gifts of free energy. 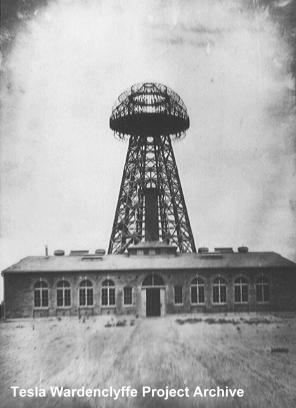 The closest Tesla came to a world wide industrial application of his Radiant Energy dream was the construction of his huge Magnifying Transmitter at Shoreham, Long Island, a site which he named Wardenclyffe. Following his return to New York City from Colorado Springs in 1899, Tesla was jubilant and full of enthusiasm to implement his plan for the commercial application of Radiant energy. He turned to JP Morgan for a substantial portion of the funding to finance the huge project at Wardenclyffe. Morgan was chiefly concerned with turning a profit from overseas radio transmissions since Marconi was fast locking up the market and Morgan, ever the aggressor, wanted a share of the market. When Tesla told him that the transmitter could transmit “intelligence” to the world, Morgan assumed that he meant ordinary radio communications, but Tesla was not referring to ordinary radio transmissions. He was talking about something much bigger, but avoided revealing all to Morgan during this early phase of the Wardenclyffe project. Some considerable time later, Tesla eventually felt compelled to tell Morgan the larger possibilities offered by the Magnifying Transmitter when he needed more funding to complete the project. Tesla thought that Morgan would be overwhelmed by his expanded explanation of the true capacities of the transmitter and would be anxious to complete the work, but Tesla’s assumption had backfired and Morgan refused to lay out any more money for the transmitter. Sadly, the enormous benefits that could have been made available to society by Tesla’s Magnifying Transmitter project, died then and there. Morgan had already orchestrated circumstances in Tesla’s life in order to force Tesla to be dependent on him for financial backing. During an earlier period, when Tesla himself had millions from his Polyphase AC generator royalty payments and other earnings, Morgan wanted to woo Tesla with a deal that effectively gave Morgan majority control over his patent rights and projects, but Tesla turned him down, telling Morgan that he had enough money of his own to fund his projects. While returning to his hotel from that very meeting with Morgan, however, Tesla was told that his laboratory had been burned to the ground. It represented a tremendous loss to Tesla and it shook him deeply. Everyone, of course, felt convinced that Morgan was behind the arson. In order to save face, Morgan was embarrassed by Tesla into putting up the money to pay for the rebuilding of a new lab as an act of “philanthropy”. From that time forward, however, other financial backers were not to be found. Morgan was powerful enough to black list Tesla among the Eastern Establishment elites that previously had hobnobbed and feted with Tesla as if he was one of their own. Black listing and ostracization by officialdom and financiers lifted somewhat after Morgan’s death, but generally continued to haunt Tesla for the rest of his life. Before the turn of the century, Tesla also willingly gave up millions, perhaps billions, in royalty earnings to George Westinghouse in an unprecedented act of friendship. Westinghouse had believed in the superiority of Tesla’s AC system and provided the money to build Tesla’s big AC generators at Niagra Falls, NY. Tesla was paid millions up front for his patents, but was also due to receive royalty earnings for every kilowatt of power produced. When Westinghouse ran into financial difficulties at a later date, Tesla tore up his royalty contract in order to save Westinghouse from financial ruin. Had he not done that, Tesla would have had enough money from royalties to keep him ensconced in great wealth for the rest of his life. The story is frequently told that when Morgan found out from Tesla that the true purpose of the Wardenclyffe transmitter was to provide free electricity to the world, he abruptly pulled the funding. That’s not completely accurate. The economic conditions were recessionary at the time and the stock market had taken a considerable dip that year. Morgan wasn’t interested in risking any more capital in perilous times on a project he couldn’t fully fathom and wasn’t completely convinced of. Tesla held land ownership of the Wardenclyffe site and tower, but no further work was done after 1910. In 1914, Tesla was deeply in debt and signed over the deed of Wardenclyffe Station to pay off years of back rent due to the owners of the New Yorker Hotel where he was living (he occupied two penthouse suites in the hotel). In 1917, the hotel owners had the tower demolished and its parts sold for salvage. Despite the loss of Wardenclyffe, Tesla continued to refine his understanding of Radiant Energy and miniaturize the equipment needed to produce it. He eventually was able to reduce the equipment down to the size of a suit case. Copyright 2001 Ken Adachi & Educate-Yourself.org All Rights Reserved. Reposting is only allowed without editing or abbreviation and placement of originating url and author's name at top of article. Next time, Part 2: The nuts and bolts of producing Radiant Energy and Gray’s Radiant design circuitry.